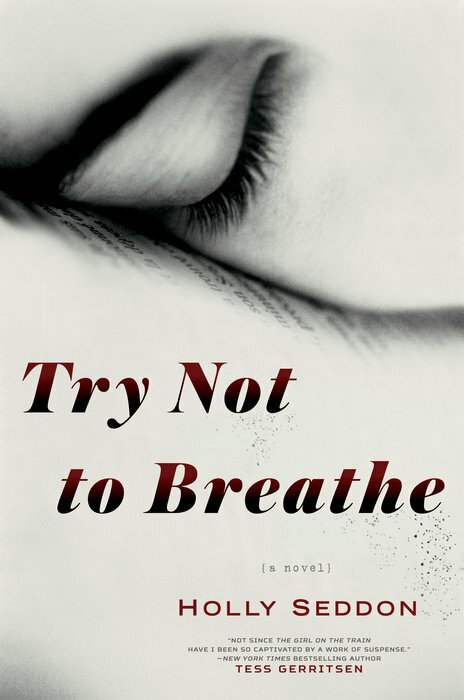 The manuscript of Try Not To Breathe came in to me at about 9:30 one night and due to some happy intersection of title and description and still being too awake to go to bed, I made a cup of tea at about 10 and decided to glance at a page or two before turning in. At about 1 a.m. I forced myself away from the book for the night but could barely fall asleep – so full was my head and my heart of the story of the two young women Holly Seddon had created. When I was in the world on her pages I had that magical and delicious feeling every lifelong reader knows when your actual surroundings melt away and all you can see are the streets and houses the characters are seeing. I finished reading the manuscript the next night and for days after I couldn’t stop thinking about Amy and Alex and what both joined and separated them. Hopefully without giving too much away, the novel is about two women, Alex and Amy, both 30 years old and from the same area of England, where they grew up going to neighboring schools. Told in alternating points of view, their lives intersect in a way that will change everything for both of them. Alex is a journalist whose life has spiraled completely out of control. She had seen tremendous success as a writer very early in her twenties when she beautifully and movingly documented the last year of her mother’s struggle with terminal illness. During this time she became incredibly sought after in London magazine circles and also married the love of her life. But when her mother dies, Alex loses her moorings and plummets into alcohol and reckless behavior, finally moving back to the house she had grown up in. When Alex is at her local hospital one day working on a small, routine story (the only kind of writing work she can now get)about vegetative cases – she finds herself staring at a young woman, a patient, asleep. The girl looks familiar to her, and suddenly she realizes that this is Amy Stevenson, a girl who had disappeared when both she and Alex were 15, only to be found near death in the woods. Amy has been in a coma ever since, and the police were never able to discover who had assaulted this girl. Amy’s family and the whole town were left mystified and damaged. Alex finds herself haunted by her own memories of that time and cannot stop herself from beginning to investigate the story. She realizes that in the fifteen years since the attack, Amy has gone from being at the center of notoriety to having been nearly completely forgotten. Of the many themes explored by Holly in the novel, two are favorites of mine. One is the phenomenon of locked in syndrome, which Holly researched and uses so brilliantly for the character of Amy, showing us the heartbreak of a young girl trapped mutely within her body. My other favorite is the music of the novel. From its title on, Holly has imbued her book with a perfect soundtrack as iconic song after song from the early to mid-90s seems to play in the background. And by the end one can see that Try Not To Breathe isn’t just an R.E.M. song title but helps introduce one of the most compelling facets of the novel – the false promise of control, and the beauty and wonder of watching Alex measure out just enough courage each day to fight her demons one more time. Read more about Try Not To Breathe below. When the proposal for Stir came in, it was subtitled “How My Brain Exploded and I Got Cooking.” What I found in those pages just about made my own brain explode. Here was a memoir by a first-time writer who had survived a traumatic brain injury, a Harvard Ph.D candidate who lost sight in one eye, her sense of smell, and a chunk of her skull so large that she had to wear a hockey helmet to protect her brain, impressive enough, but what made the proposal a standout was not her injury, but the way she wrote about how food and the simple everyday acts of cooking, baking, stirring, sautéing, and sharing it, helped her to heal. As she writes in the book, getting well meant finding her everyday, and she found hers in the kitchen. This stunning book didn’t fit neatly into any category in the bookstore, but everyone at Penguin Random House who read it loved it, and we knew we had to publish Stir. Every author takes an approach to writing that makes sense to them. Some outline, others write set pieces to be stitched together later. Some write almost in a fugue state, getting the book down on paper from beginning to end, barely stopping to put in commas. Jessica was not that kind of writer. She was careful, precise. Every word worked at the sentence level. The challenge with Stir was broader—we didn’t want the book to be pigeon-holed as a recovery memoir, but we also knew that her illness was the natural beginning of her story. During editorial talks, we spent much of our time discussing how to weave various strands together. First, of course, there was the aneurysm. Then, there was the food—the facts of cooking it and eating it and recovering because of it. Beyond those two main threads, there was a love story between Jessica and her unflappable husband, Eli, including their attempts to start a family (spoiler: they do! as anyone who follows her wonderful blog, sweetamandine.com knows from the pictures of her two adorable daughters she posts there); an ode to the constellation of women in her life—her mother, stepmother, grandmothers, her Aunt Fran, and close friends—whose influence she feels strongly in the kitchen; and, finally, the story of how she came to a new understanding of the link between food and identity. As we’d talk, Jessica would occasionally ask me, “How do you think I should…?” We’d mull it over and then she would go off and come up with a perfect solution. When I said as much, more often than not, she’d respond that she had simply looked at a memoir she admired to see how that writer succeeded in doing whatever it was Jessica herself was trying to do. She was applying the skills she’d honed as an academic to the process of writing a memoir. She read and dissected every memoir she could get her hands on —Wild, The Liar’s Club, Eat, Pray, Love, and My Stroke of Insight, and dozens of others– to pick them apart and learn how they performed different feats of narrative and storytelling. She marked her copy of Wild with a “Pivot!” in the margins next to the places Cheryl Strayed switched from one subject to another without losing the reader, and then figured out a way to make the technique her own in Stir. It was as if she was reading to defend her dissertation and her dissertation was how to tell the story of her life. Again and again, I could see her incorporating the lessons she’d gleaned from the writers she loved into her own book. One day, she sent me a document I’m not sure I was meant to see. It was an eleven page spreadsheet with columns delineating plot, characters, conflict, what we learn (general), what we learn (food), and “to do.” It showed an awareness of how the book was working—or not—from a structural perspective, which helped to keep everything in balance. Another time, she sent me a file that had all of the material dealing with Eli in one document so she could make sure the story hung together, which it did. This all sounds terribly clinical, but the book that came out of it is anything but, despite a good part of it taking place in and out of hospitals after brain surgery. 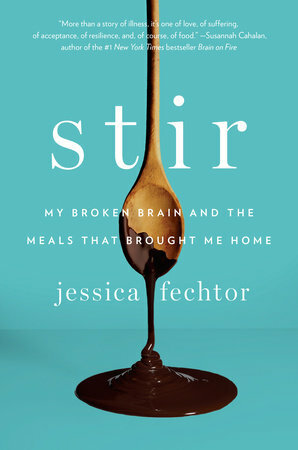 What I love about Jessica’s writing, especially her writing about food, is how unfussy it is—the opposite of academic writing with its particular conventions, and different, too, from a certain type of food writing, the kind with sumptuous descriptions of dishes that sound like menu items at a restaurant where almost no one can afford to eat. Jessica, however, writes every bit as much for the person who swoons over grass-fed butter as she does for someone who savors a Ritz cracker melting on her tongue. She writes exquisitely but without pomp about how the way we prepare food and who we eat it with connects us to our past, our future, and our true selves. The moments where she connects to food shine brightly on the page. She writes about the smell of cucumber when her olfactory nerves kick in again, the mushrooms chopped for a favorite pasta dish when she first returns to the kitchen, and an almond cake resting on a counter that acts as a Proust’s madeleine of sorts as it lets her know, as she writes, that food had something to teach her, and that it felt good to listen. I am glad that she did. Read more about Stir here.